"Innovation is thriving in areas outside Silicon Valley. Upstate New York is a prime example supported in large part by Governor Cuomo who encourages entrepreneurs who can execute on this important vision," said Austin McChord, Founder and CEO of Datto. "Establishing roots in Rochester has been the right business decision for Datto. A quarter of our Rochester employees were hired in the last year, and we're still growing. Attracting smart local talent allows Datto to grow here and gives employees the opportunity to take advantage of living in an affordable and welcoming city like Rochester." The Governor today also announced the establishment of the Finger Lakes Forward Venture Capital Fund (FLX Fund). The $25 million targeted investment fund will provide early-venture stage capital investments ranging from $500,000 to $1.5 million for startup companies in key high-tech industries such as advanced manufacturing, life and material sciences, optics, photonics & imaging and others. The fund will be managed by Excell Technology Ventures, an offshoot of Excell Partners, and was a priority project identified to help increase access to capital for growing companies in the FLREDC's Finger Lakes Forward Upstate Revitalization Initiative strategic plan. Excell Partners CEO Theresa Mazzullo said, "The Finger Lakes Forward Venture Capital Fund is yet another example of how Governor Cuomo is making upstate NY more competitive. This Fund will help to close the capital gap by providing funding that will help high tech startups expand and grow. Excell's 12-year track record shows a direct correlation with investment and job creation. The FLX Fund is guaranteed to bring more new jobs to the Finger Lakes Region. We owe a debt of gratitude to the Governor for his ongoing support for innovation in upstate." To be eligible for an investment from the FLX Fund, a company will be required to be located somewhere within the nine-county Finger Lakes region, and maintain either its headquarters in the area or ensure that at least 75 percent of its employees are working in the region for a period of no less than three years after that initial investment. The targeted investments will require a 2:1 private to public match over the life of the fund, with a minimum 1:1 match for any individual investment. Empire State Development will receive 80 percent of the fund profits or gains from the investment; Excell Technology Ventures will retain 20 percent to be reinvested in the fund. Excell Partners, an affiliate of the University of Rochester, is a seed and early stage venture fund that invests in high tech startups supporting the Finger Lakes region's economic pillars. "The expansion of Datto, Inc. advances the growth and success of Rochester's innovation economy," said Lieutenant Governor Kathy Hochul. "Companies like Datto and the creation of a new venture capital fund are attracting new businesses, creating good-paying jobs, and boosting the economy of the Finger Lakes -- putting upstate New York on the map for high-tech innovation. Datto's growth in Rochester is a major step forward in our work to transform the Finger Lakes region into one of the nation's leading high-tech innovation hubs. Empire State Development President, CEO and Commissioner Howard Zemsky said, "Datto's decision to expand in downtown Rochester is a tremendous example of the top-tier tech talent in New York State that is growing our innovation economy. 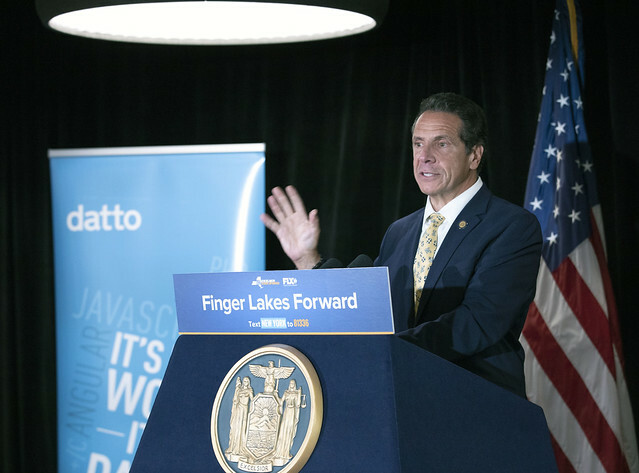 Strategic investments from the Finger Lakes Forward Venture Capital Fund, along with State programs encouraging and supporting entrepreneurship, will draw even more companies like Datto to the region, leading to new jobs and a stronger economy." Finger Lakes Regional Economic Development Council Co-Chairs Monroe County Community College President Anne Kress and Rochester Chamber of Commerce Bob Duffy said, "Datto's continued growth and our support for the Finger Lakes Forward Venture Capital Fund further builds on the economic momentum we have worked so hard to create by further positioning our region as a global leader in advanced technology research and development. We wholeheartedly congratulate Datto on its further expansion which is providing high-quality jobs and careers for the men and women in our community." Rochester Institute of Technology President David Munson said, "We are so incredibly proud of Austin McChord and his innovative company, Datto, whose staff includes many RIT alumni. Austin, who is an RIT alumnus and a trustee, embodies the risk-taking, entrepreneurial culture that is ingrained in our university, and the desire to make the Finger Lakes region and the world a better place. We are delighted that RIT, with significant help from Gov. Cuomo and New York State, has been able to support Datto's growth, and we wish Austin and his company much continued success." Assembly Majority Leader Joseph D. Morelle said, "Datto continues to be one of Rochester's most exciting success stories and the magnitude of their continued growth and success is yet another indicator of the strength of our region's economy. Most importantly, Datto's expansion in Rochester will create 200 new job opportunities with good wages that will continue to strengthen families and create a more vibrant future for our region." State Senator Joe Robach said, "Every job is critically important for the Rochester region and our economy. The fact that Datto, Inc. is adding 200 good paying engineering and tech support jobs for our local workforce is reason for celebration, as is the opening of their new office space located inside the Metropolitan. Early investment and funding are critically important help creating emerging technology and new jobs." Assembly Member Harry Bronson said, "I applaud Austin McChord, and his team at Datto for their commitment to our region. Today's announcement by the company and Governor Cuomo shows that the Rochester area has a strong, diverse, and skilled workforce and is in an economic position to create jobs for the future. I look forward to Datto's growth and the addition of these new jobs at their new Downtown Rochester campus." Rochester Mayor Lovely A. Warren said, "I want to congratulate the team at Datto for their success in Downtown Rochester and thank them for believing in the vitality of our city and continuing to invest in our community. I am also grateful to Governor Cuomo and Empire State Development for their work to retain and grow these jobs in Rochester through Finger Lakes Forward and helping us achieve our goals of creating more jobs, safer, more vibrant neighborhoods and better educational opportunities for our citizens."